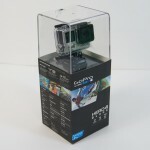 GoPro cameras have become popular among adventure lovers of all kinds. These awesome little waterproof action cams can be worn or mounted in various ways so that you can get all sorts of amazing videos from a personal perspective, making the resulting videos much more exciting than merely watching someone do something daring. 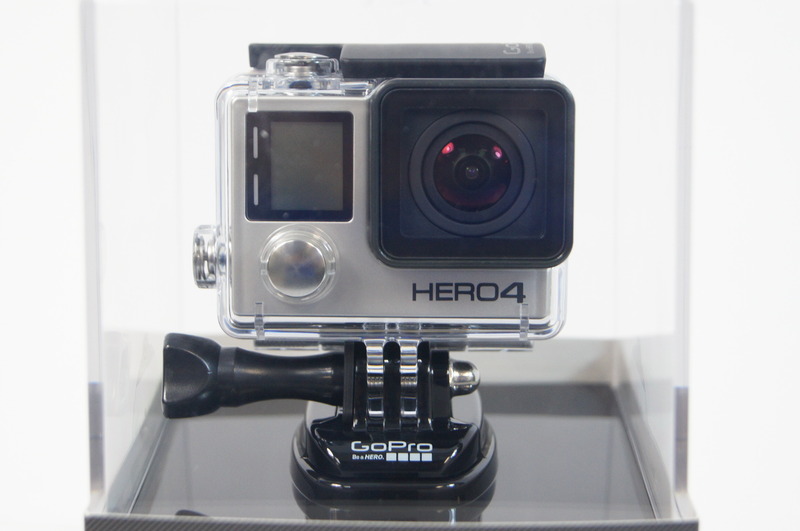 One of the latest additions to the GoPro line of cameras is the Hero 4, and we were lucky enough to get our hands on one to play with. An adapter arm for the mounting system. 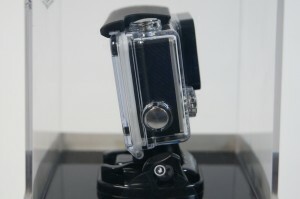 Additionally, the flat black base plate that the camera is packaged on can be used as a simple tripod, so don’t throw it away with the rest of the packaging. 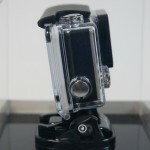 The Hero 4 Black is considered to be the flagship camera and is targeted at people who want the best quality video possible – and of course, who are willing to pay $500 to buy one. 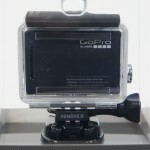 The processor is twice as powerful as anything we’ve seen before in any GoPro camera and can record at up to 4K resolution and 30 frames per second (fps.) It can also capture 1808p at 120 frames per second, which means the video is remarkably smooth in both high-speed and slow-motion scenes. With the 60Mbps recording bitrate, this is one very powerful but tiny camera. 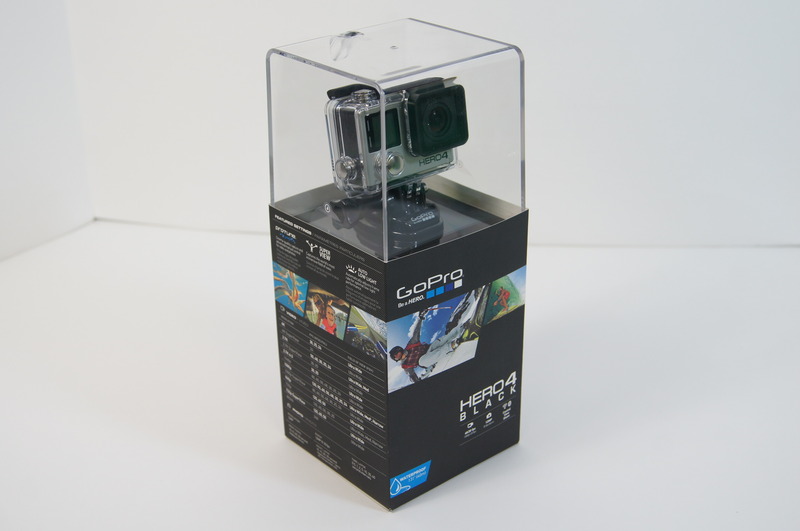 Anyone familiar with the Hero3 or 3+ Black will notice a few changes with the Hero 4. 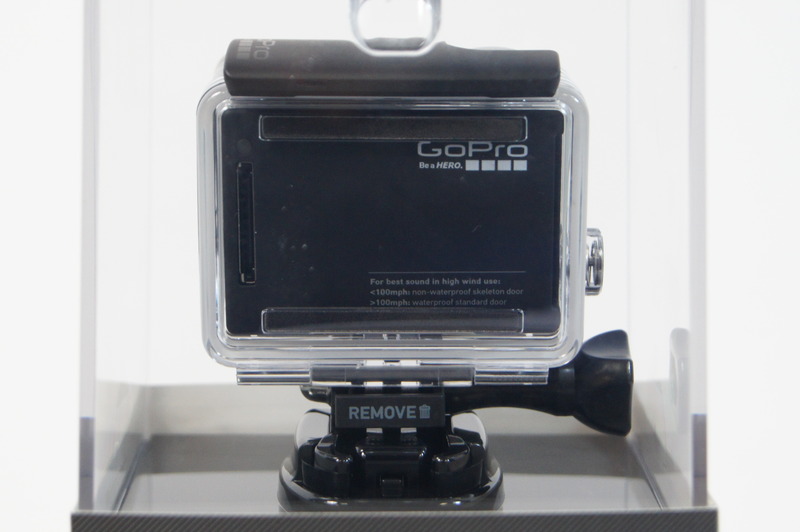 The biggest change is the battery compartment design. Instead of sliding in the back, it now drops into the bottom, which makes swapping batteries more convenient. However, this did mean that the battery itself had to be redesigned, so you can’t use batteries from older models. Another huge change from previous models is the camera’s buttons. While the layout is the same, what used to be the Wi-Fi power button is now a Hilight Tag button, meaning that you can highlight, or tag, cool moments in your video so that you can find them quickly in the future. To use this button, just hit it immediately after you’ve recorded something cool, and it tags it for later viewing. When you aren’t recording, the same button acts as a menu button and gives you access to all settings. The menu on the GoPro 4 has been cleaned up a lot from previous versions, and everything is sensitive to the mode you are in, meaning that if you’re in video capture mode, you will only see relevant settings if you press the button. 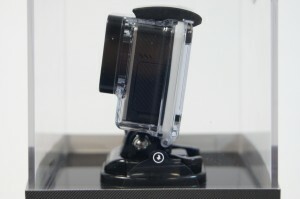 On the left side of the camera is a removable cover that protects the Mini-USB and Micro-HDMI ports, and the MicroSD slot, which supports cards up to 64GB. Apparently, the Mini-USB is used for transferring content and charging, but it can also be used to attach an external mic if necessary. 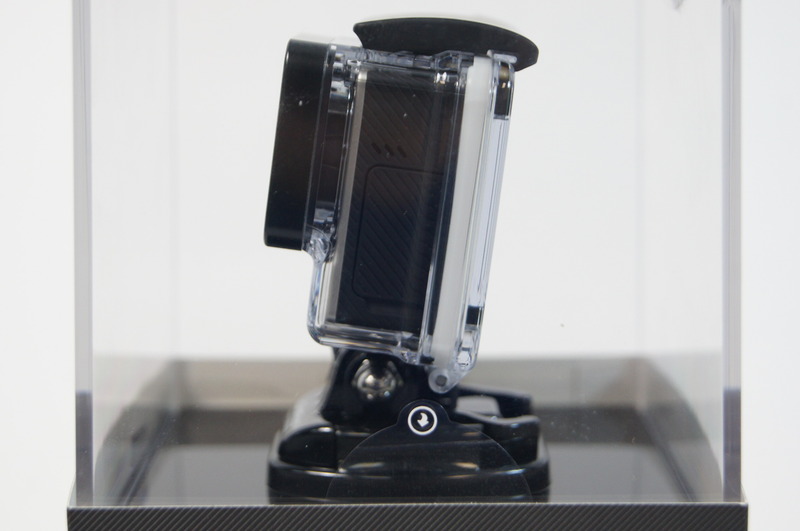 The Hero 4 Black doesn’t have a built-in touchscreen, but a port on the back allows you to attach an LCD Touch BacPac from GoPro or their Battery BacPac. Unfortunately, this device has much worse battery life than any of the older models and only runs for about an hour at the highest video recording settings, less if you have Wi-Fi turned on. 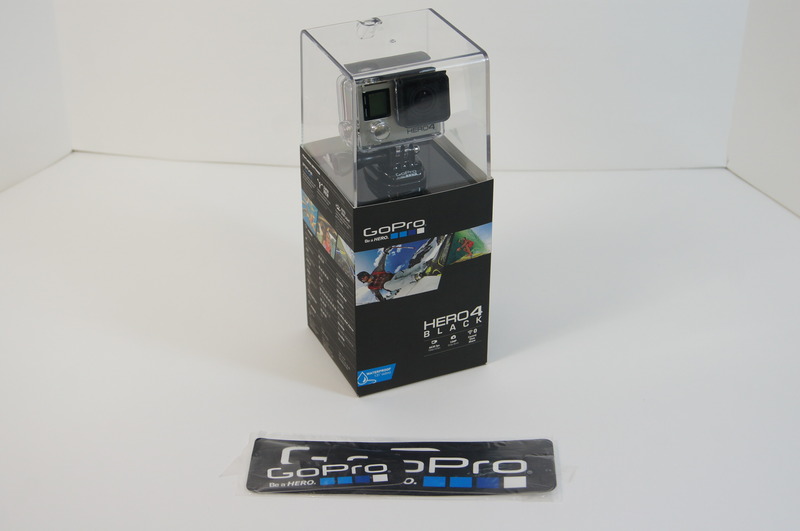 The GoPro Hero 4 application lets you control your camera remotely and gives you access to the GoPro YouTube channel, which has some awesome content. Using the app, you can start and stop recording, adjust settings, capture images, tag key moments, change modes, playback videos, share your footage, update software and more. If you are an adventurer and want amazing video images of you skydiving, scuba diving, cross country cycling, bungee-jumping, skiing, or doing one or more of the many other extreme or adventurous hobbies and sports, then a GoPro Hero 4 is the camera for you. 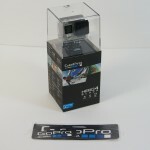 While we have been lucky enough to try out the GoPro Hero 4 Black, there is also a Silver version, which includes an LCD screen that many people may prefer. 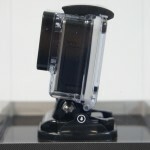 Either model are excellent options for taking video and stills while on the go. 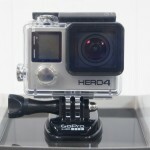 Do you have an old camera or other gadgets that you’d like to sell to make room for a new GoPro Hero 4? Click here to find out how to get the best prices. 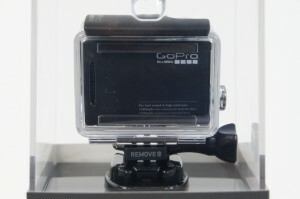 The newest version of the GoPro camera is a hit.